As a long-married couple, there have been a few occasions where my husband and I suddenly realize we remember “facts” differently, and have to do a little research to settle the matter. After a little more discussion and a friendly wager (say, for the inclusion/exclusion of raisins in baked goods), I usually run into the house to check some of my 237 guidebooks* for proof that I am right. But on one of those occasions, I was wrong. The innocent insect that started a discussion. I went in to research, and found out I was wrong. Kind of. A little bit. 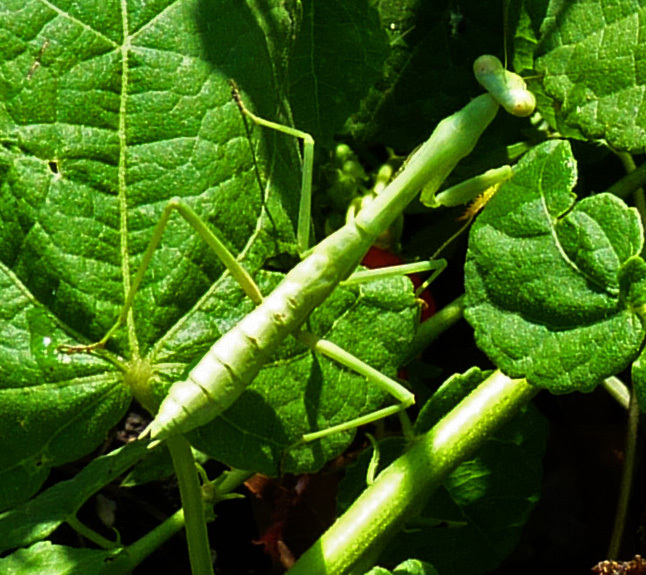 These insects are referred to as “praying mantises” and not preying mantises, but in a generic sort of way, as actually there are many species. Neither of us knew that. 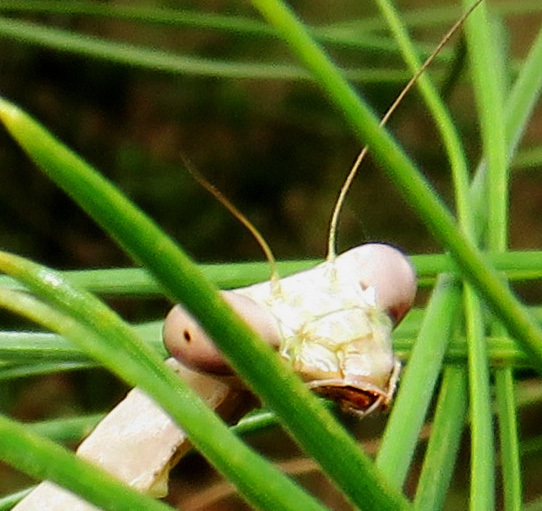 The ones we see here are native species, Carolina Mantis (Stagmomantis carolina). 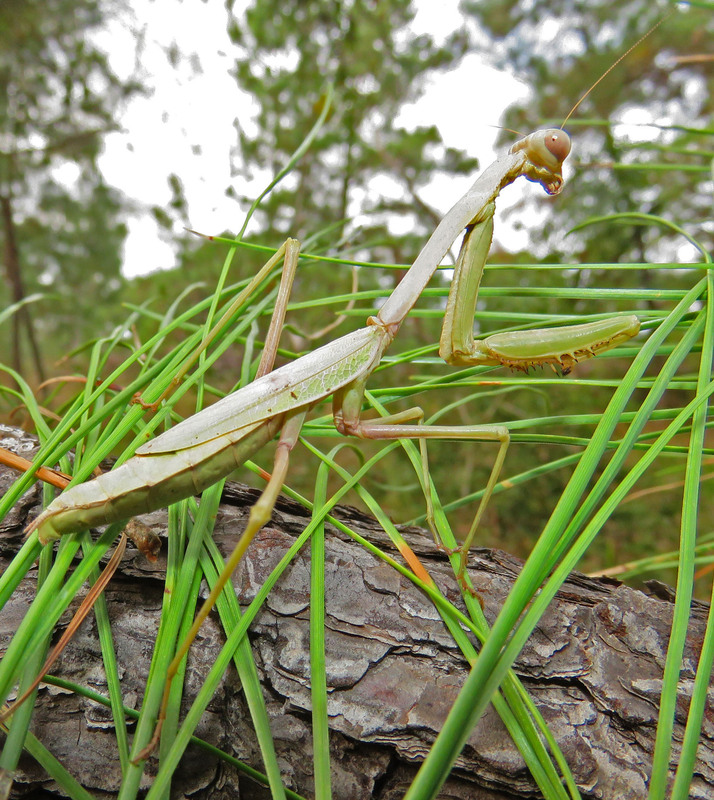 The other day I found this female about a meter off the ground on a bent pine tree. She began to move back and forth just a little, like a leaf shaking in the wind. (I had just read about this behavior on a blog, but I’m not sure which one. I think on Victor Rakmil Photography, but now I can’t find it there.) I was assuming this was to disguise herself as a leaf, but I have also read on Wikipedia that the movement might be a way to see better, to distinguish foreground from background. The females’ wings are too short to allow them to fly, so they sit and wait for prey to happen by, and they also give chase. A few years ago, I came across a female making her egg case on a lawn chair. I thought the braided pattern was beautiful, and now I am wishing I had paid more attention to her actual motions. I didn’t think a canvas chair in the middle of the yard was a good location, so the next day, I took it into the house and kept it in a jar until the babies hatched. I released them outside, but kept the egg case. 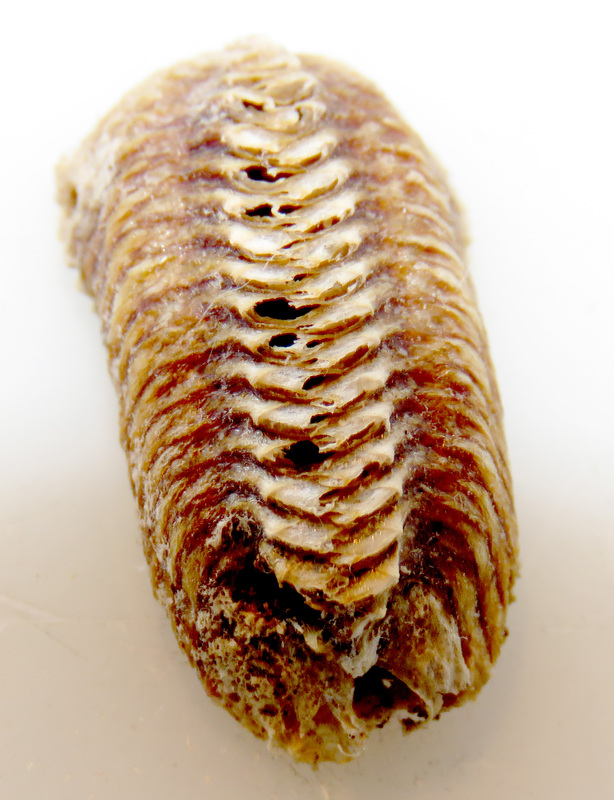 The underside of the egg case. I believe the holes in the side and on the top are where the young mantises emerged. The males have long wings, and are sometimes attracted to lights at night, so sometimes we get one in the house. 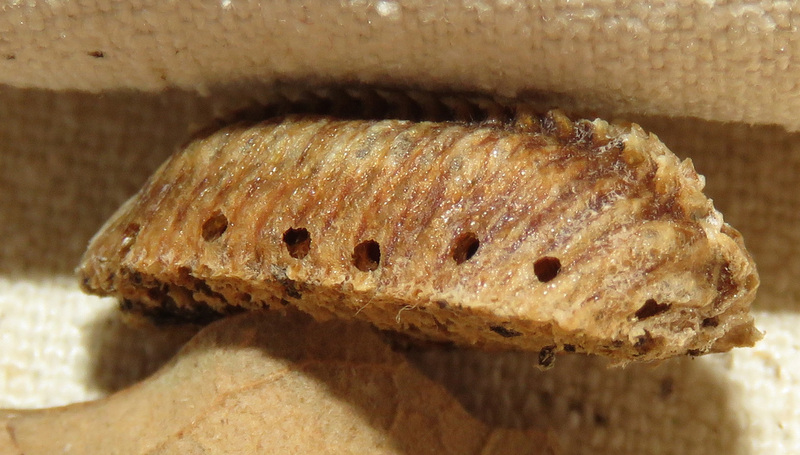 On this male, you can see the three eyespots that are between the compound eyes. 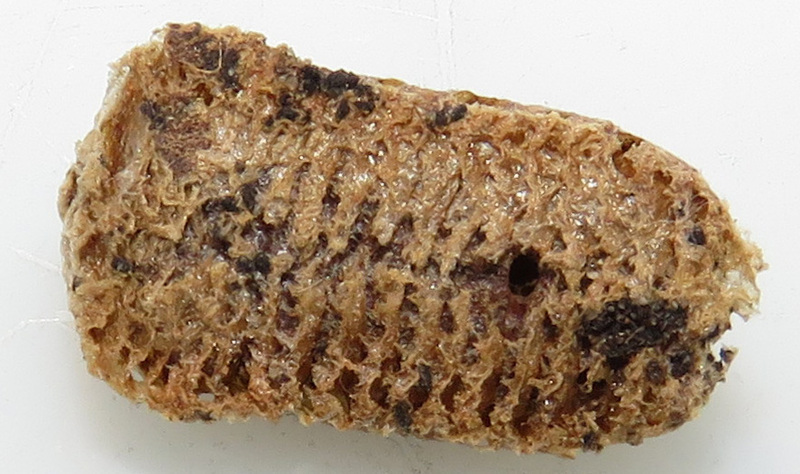 Close-up of face, showing eyespots between compound eyes. I tried upping the contrast on this picture of the female’s head, but if she has those simple eyespots, I can’t see them. But I also can’t find any information that says that females don’t have them, so maybe my picture just doesn’t show them. *number of guidebooks estimated. I sometimes think about counting them, but I end up sitting down and reading one. My niece captured a picture of a Chinese mantis holding its meal — a ruby-throated hummingbird. They tried to rescue it, but it was too late. The bird was dead already. As to guide books, I try to inventory my quilting books at least once a year. (Note to self: time to update the list.) I keep an Excel spreadsheet. I also check the books to make sure each has a return address sticker inside. I rarely lend my books, but when I do, I want them back. 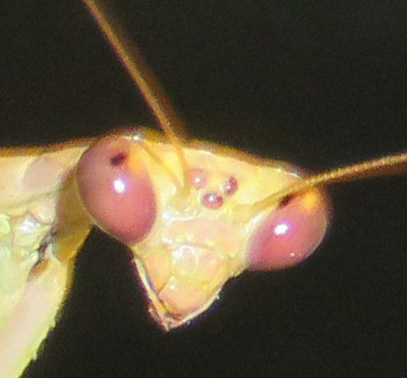 I just read that about praying mantises, that they will capture birds! But I have never seen it. I get a lot of these guide books free at different volunteer events – I know species’ names change, and ranges change, and so on, but I usually glean different facts from each one. And I love the illustrations in the older ones. Initially I thought that etymology might clarify things, since ‘mantis’ has to do with an ancient Greek prophet / priest figure, but then I realized that it actually kind of complicates things: if it’s already a priest, do we need to clarify that it’s also *praying*, or would it make more sense that it be picked out as *preying*, since that’s less obviously something a holy figure would do? And I think the latter. So I put myself in your camp because linguistic logic, scientific facts and conventions be damned. In any case I’ve always found them disturbingly uncanny, so *preying* is better on that front too. So there. And no one prays with their hands hanging down from their elbows. That posture is reserved to characters like Igor who are rubbing their hands with evil glee. So if scientists looked into it a little more carefully (and if they had more of the humanities in their education), they would be bound to agree with us! Thanks for siding with me. I will be sure to offer my husband this further proof that I am right. I saw your title and thought “I HATE it when that happens!” HA! My husband and I are always making similar wagers (and I have a button I wear that says “Does it bother you I’m always right?”) But I’m glad your husband won if it meant oatmeal cookies WITHOUT raisins . . .
Kerry! Someone who creates gourmet chocolates doesn’t like raisins in baked goods? I’m shattered!